It is time to put something on the blog. I made it on machine. 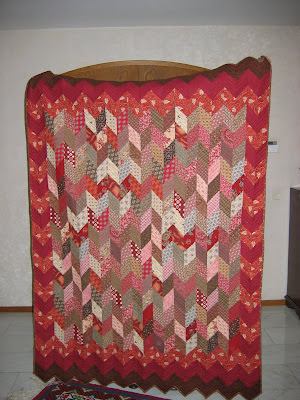 love this one, looks great with the border, I always love red and brown quilts. Beautiful!! I love your quilts! Love the quilt. I am fond of prairie braid and this one reminds me of it. Two of my favorite things, red and the prarie braid. You did a great job.